Propose: To teach people that to disobey God is to invite disaster, and to show that God suffers when his people suffer. Dare written: Soon after the fall of Jerusalem in 586 B.C. Setting: Jerusalem had been destroyed by Babylon, and her people killed, tortured, or taken captive. Key verse: "I have cried until the tears no longer come, my heart is broken. My spirit is poured out in agony as I see the desperate plight of my people. Little children and tiny babies are fainting and dying in the streets" (2:11). Special features: Three strands of Hebrew thought meet in Lamentations-prophecy, ritual, and wisdom. 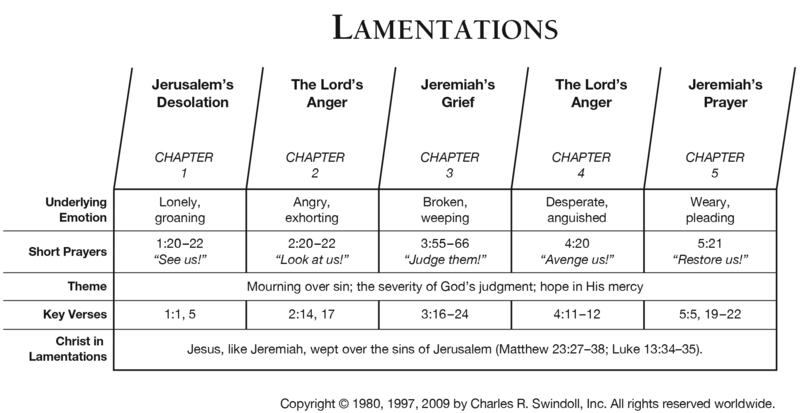 Lamentations is written in the rhythm and style of ancient Jewish funeral song or chants. It contains five poems corresponding to the five chapters. Nelson's Teaching Outlines of the Bible . 1997, c1986 (electronic ed.). Nashville: Thomas Nelson. 2:11 Some men today rarely if ever cry. But is that healthy? Tears can be a genuine and appropriate way to express feelings. An inability to ever shed tears may be symptomatic of a problem. Unlike many men in certain cultures today, the men portrayed in the Bible seem to have had little if any shame about weeping. They apparently felt free to express pain and grief, as well as joy and gladness, through their tears. For example, Jeremiah wept bitterly over the terrible plight of his people after Jerusalem fell to the Babylonians (Lam. 2:11; compare Jer. 9:1). The table below lists other men in Scripture who came to tears and the occasions that brought them to it. As you consider these men, ask yourself: What moves you tears? If you never cry, why not? Wept and mourned when his wife Sarah died (Gen. 23:2). Cried tears of joy when he met his cousin Rachel (Gen. 29:11). Sought out a private place to cry when he finally met his younger brother Benjamin after years of involuntary separation (Gen. 43:29–30). Cried together as they parted company after Saul’s vicious attacks (1 Sam. 20:41–42). Wept as he foresaw the cruel evils that Hazael’s troops would commit against Israel’s women and children (2 Kin. 8:11–12). Wept bitterly when he was told he would not recover from a sickness (2 Kin. 20:3). Broke down in tears when the foundation for a new temple was laid (Ezra 3:12). Wept over the disobedience of the Jewish men who had married pagan wives (Ezra 10:1). Was moved to tears on hearing a report of conditions at Jerusalem (Neh. 1:4). Poured out his tears to God after the painful loss of his goods, family, and health (Job 16:20). Grieved with tears over the troubles that were coming upon his people (Is. 22:4). Was moved to tears at the tomb of His friend Lazarus (John 11:33–36). Wept with bitter shame after he realized that he had betrayed his Lord (Matt. 26:75). Acknowledged that he was sometimes moved to tears in his work (Acts 20:18–19). Wept as he realized that no one was worthy to read a scroll in heaven (Rev. 5:4). Word in life study Bible . 1997, c1996 (electronic ed.) (Lm 2.11). Nashville: Thomas Nelson. Jeremiah grieves deeply because of the destruction of Jerusalem and the devastation of his nation. But in the middle of the book, in the depths of his grief, there shines a ray of hope. God's compassion is ever present. His faithfulness is great. Jeremiah realizes that it is only the Lord's mercy that has prevented total annihilation. This book shows us the serious consequences of sin and now we can still have hope in the midst of tragedy because God is able to turn it around for Good. We see the timeless importance of prayer and confession of sin. We will face tragedy in our life. But in the midst of our afflictions, there is hope in God.